Ever want to build macros to make routine tasks easier and more efficient in Microsoft Project, but you are not a programmer? This presentation will give you building blocks and the confidence to build all types of macros. After the presentation you will be ready to build tools to automatically transfer views, tables and filters to all the members of your group, interface Project with Excel and build your own network analyzer. Along the way, there will be descriptions of the elements of the code as well as a demonstration on how to debug your macros. Jeff Fenbert is a Process Engineering at the Boeing Company. He has been a Project user and enthusiast for many years and is a frequent presenter at MPUG meetings. Jeff has developed and taught Microsoft Project and Project Management classes at Boeing and a local Community College. Found this webinar really useful, thanks Jeff for taking the time to present this. Can you confirm where we can find the macro’s used in the presentation? I cant seem to find it on the page.. 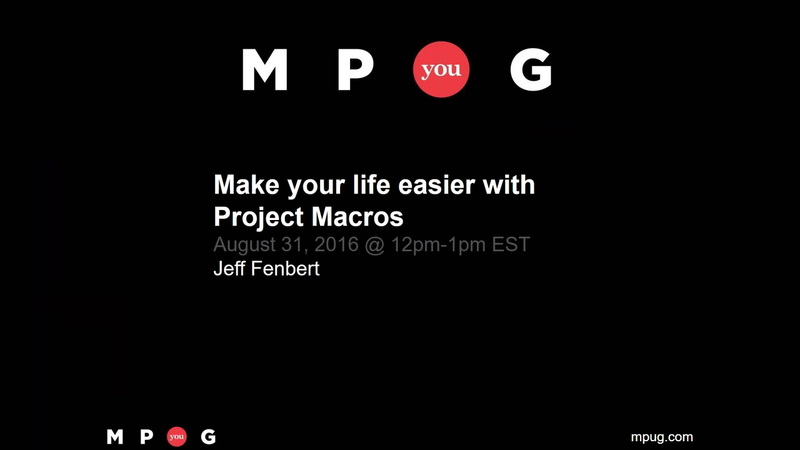 I just watched your webinar for Making Your Life Easier with Project Macros. I’m looking for a way to export the task usage view into Excel. Looking for a table with the task names in a column, the team member’s name in another column — both followed by the # of hours required per week for the duration of the project. Do you have anything like this or could you point me in the right direction?